This widget keeps a live count of your Facebook Live stream reactions - Like, Love, Haha, Wow, Sad and Angry. 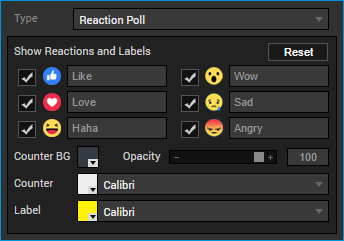 You can customize the text colors and labels, and select specific reactions you want to show. 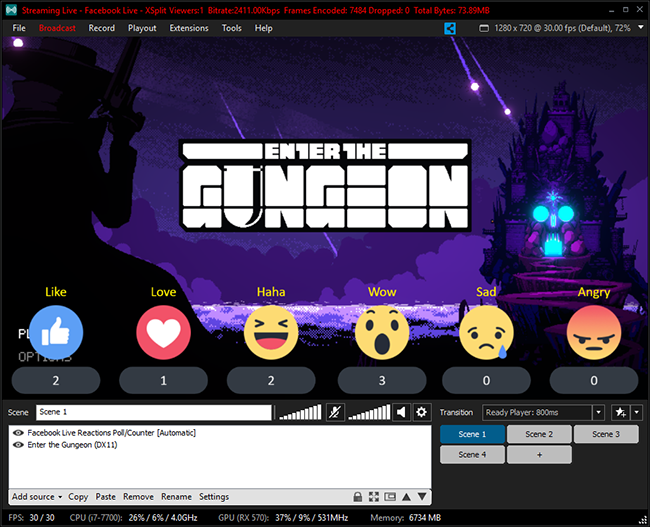 Go to Add source > Facebook Widgets then Live Reactions Counter. The Facebook Live Reactions Counter widget will now appear on your scene. It will display Not connected to any Facebook Live video if you're are not currently broadcasting to Facebook Live. Displays the currently authenticated Facebook account. Your Facebook account is automatically authenticated with the plugin if you login into XSplit Broadcaster using your Facebook credentials. Click on Switch account to switch and authenticate a different Facebook account. Displays which Facebook Live post the widget is connected to. This set to Automatic by default and will connect to the Facebook Live post you are currently broadcasting to. You can also change this manually by clicking the drop-down. 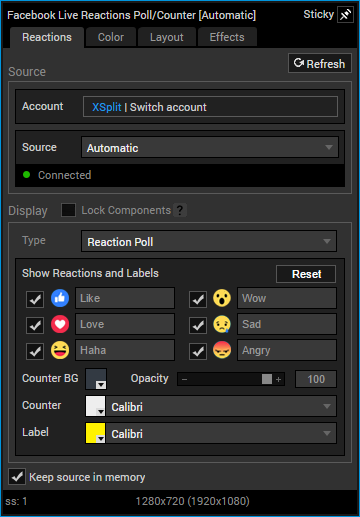 Choose whether to display a Reaction Poll or Reaction Counter. Enable or disable which reactions will show on the widget as well as replace their labels. Changes the counter's background color. Click to choose from a preset pallete or to enter a hex triplet. Changes the counter's background opacity. The opacity slider will go from 0 to 100 percent. Changes the font and color of the counter and their labels. Colors can be chosen from a preset pallet or an entered hex triplet while the fonts can be chosen from the drop-down.